Walk into North Hall at CES and you'll be forgiven for mistaking it for an auto show. Some of the largest car manufacturers from the US, Europe and Asia are all eager to show off their latest technical developments in autonomous driving and in-car tech. One of the largest stands at this year's show was Volkswagen, which is keen to demonstrate it's autonomous, electric, and personal future. We had a chance to test out the latest developments. First, we're going to look at the features coming to a VW near you soon, then take a look at the Volkswagen I.D. concept for 2025. Current Volkswagen cars have MirrorLink, Android Auto, and Apple CarPlay, allowing drivers to access apps and services from their phone on the vehicles infotainment system. 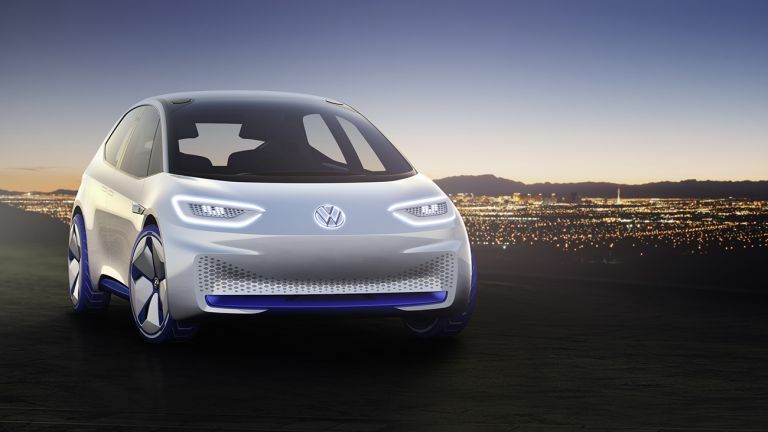 At CES 2017 VW has announced it’s plans for a more personalised experience with Volkswagen User-ID, allowing users to build a profile of their personal settings, integrate any services from third-party sources and port them wherever they wish. Then, whenever they step into a Volkswagen (personal or rental car), the vehicle can prepare your favourite music, configure the display screen and make the right seat adjustments. We experienced a demo of this at Volkswagen’s stand, creating a profile in VW’s CES app, and selecting our preferred ambient light colour. All settings are stored in the cloud, and features could extend to limiting the performance of the engine when your teenage kid gets into your brand new GTI. Volkswagen also announced that integration of T3’s favourite voice assistant, Amazon Alexa. Soon, you’ll be able to control devices in your home or office using your voice in the vehicle. Driving home from work? Tell Alexa to turn the heating on and turn off the alarm. Users can also ask Alexa to perform advanced functions such as resuming an audio book they began at home. Additionally, Alexa will work in reverse, combining the service with Car-Net functions. Before you set out on a long journey you can say "Alexa, ask Volkswagen how much fuel is left in the tank" to determine if you’ll need to fill up along the way. Aside from voice control, the way we interact with VWs is about to change as well. Volkswagen showed off it’s ”Interactive Experience” representing an extension of operating concepts presented at previous shows. The Volkswagen Digital Cockpit (3D) is making its debut, using two overlaid screens produce a fascinating depth effect. This could allow the system to prioritise between key, critical information, and secondary, less important information. Finally, the real and virtual worlds merge into one with the AR Head-up Display, projecting graphics onto the road in front. Look familiar? Yep, VW announced the I.D. concept back at Paris Motor Show 2016, but we’ve finally got a chance to get up close and personal with it. I.D. is a fully electric car autonomy car and we think it looks great. It’s Volkswagen’s vision for motoring in 2020, and the company expect it to be fully autonomous by 2025. Volkswagen claims the I.D. will be able to manage 600km (around 370 miles) on a single charge. The car will be the first built on VW Group's Modular Electric Drive (MEB) platform, which should result in far more space inside while keeping exterior dimensions compact. Perhaps the coolest feature is that, just like in the Audi in I,Robot, there’s a steering wheel that disappears into the dash when autonomous driving is engaged. Although production of the Volkswagen I.D will begin in 2019, with the vehicle expected to go on sale in 2020 full autonomy will come later, around 2025. Other manufacturers have said autonomy will come sooner, but when VW says autonomy, it’s means fully driverless. This could be unlocked in a software update. Of course, the 2020 will still have semi-autonomous features such as self parking and adaptive cruse control. Excited for the future? We certainly are! But I'll be setting a reminder on my phone to see if VW follows through in 2025.